Princess Syalis, the princess of the human kingdom, “Goodereste,” has been kidnapped. The kidnapper is Twilight, who is the current Demon King, and he has imprisoned the princess in his “Demon Castle.” While the human kingdom goes into panic over its missing princess, the princess herself is… bored... and just wants to get a good night's rest. 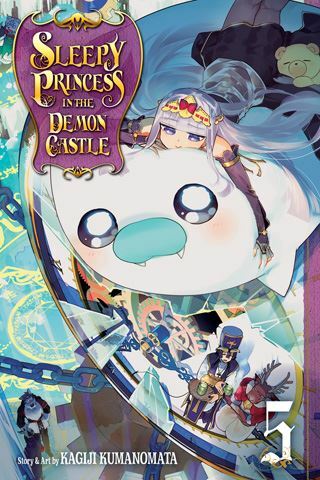 As Sleepy Princess in the Demon Castle, Vol. 5 (Chapters 53 to 65) opens, the Demon King and his minions have discovered that the princess does not know the human hero, Dawner, who is supposed to rescue her, the same way they do. Instead, she wants to share a nightmare about “Daw-What's-His-Name.” Syalis even misses the point that “Harpy,” a young female demon, wants to be friends, but Syalis wants to make friends with the demons. So the princess opens a pillow boutique. Also, the demon, Poseidon, and the princess go to war. Then, it is “Hostage Reeducation Week,” and the Demon King believes that bringing in new human hostages will teach the princess, who takes liberties, how to act like a real hostage. THE LOWDOWN: The Sleepy Princess in the Demon Castle is light reading, as far as humor comics go. This episodic, comic fantasy is super-cute and quite funny, and there are always “Teddy Demons” to make everything seem right with the world. Sleepy Princess in the Demon Castle Graphic Novel Volume 5 offers the usual hijinks. A two-chapter story and a three-chapter story offer a nice change of pace. Every time I think that I am ready to move on from this series, something (usually Teddy Demons) drags me back in.